Welcome to Spruce Sands RV Resort. 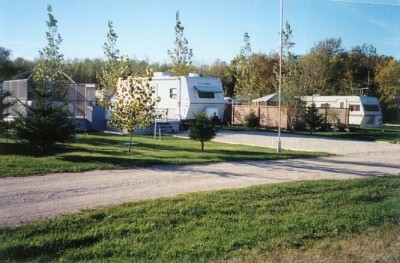 Our family campground has been a favorite summer getaway for the past 50 years. Since then we have seen many changes, improvements and expansions. All of our 315 sites are large & fully serviced with 30 amp electrical, water & sewer hookups. Our overnight sites have been renovated for your camping enjoyment. Those overnight sites, in E 1 to E 9, offer you a choice of either 30 amp or 50 amp electrical service. Your trailer will sit on a large limestone driveway with a concrete patio right outside of your door. Enjoy the lush greenery around your site, visit the playground or beach for some exercise or just sit around your firepit enjoying the evening stars. Nestled on the west shores of Lake Winnipeg all our sites are within easy walking distance of the beach, store, cafe & bake shop. You may decide to take a fabulous homemade hamburger back to the beach or you may want to sit in our air conditioned restaurant enjoying a freshly baked dessert and beverage while enjoying the view of Lake Winnipeg. While you are relaxing at the cafe or at the beach you may want to keep connected by using our complimentary wi fi hot spot. Part of the many amenities our customers enjoy are the clean modern washrooms, showers, laundromat, propane sales, putting green, kayak or bicycle rentals, and our ever changing playground area. A 6-hole putting green helps to get you into full swing. Mom & Dad can enjoy “putting around” or playing horseshoes while watching their children at play. Once you have “mastered the putt” enjoy one of the many golf courses close to the resort. If golfing isn’t your game, swim, kayak or windsurf off our beach. Launch your boat from the local marina, or fish off the local fishing docks. Just a short drive south of us is Gimli. Some of the sights include the seawall of artwork, a beautiful new museum and gallery, fishing and sailing boats of all sizes, and a variety of shops to delight everyone. North of us is Arborg, a vibrant farming and tourism community which has the lovely Icelandic River meandering through the town. When you get tired of ‘Relaxing’, visit a few of the unique and interesting towns in the Interlake.